Due to all of the requests we have had for picture frames, we are proud to release our new line of “Picture This!” personalized picture frames. This Kitty-Cat picture frame comes complete with hooks and ribbon for hanging. It also has magnets on the back for those who would prefer to use as a magnet. It is very detailed and is the perfect frame for your beloved Kitty-Cat. Hang it on the tree at Christmas then when Christmas is over you can put it on your refrigerator or take to work and put on your file cabinet. 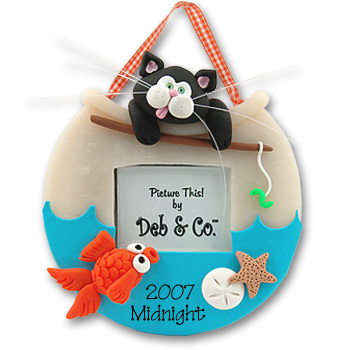 This frame is handmade from polymer clay and copyrighted and protected by Deb & Co. OH...TOO CUTE! !